This Saturday past, I ran a session of the Gumshoe time traveller TimeWatch, by Kevin Kulp, at the Dragonmeet convention in Kensington. Not yet finished, funded or available (my understanding is it’ll be Kickstarted some time soon), I ran it from a playtest copy of the rules and a very brief outline for an adventure. I hope to hear news from Pelgrane Press in the not too distant future on getting TimeWatch out to everyone! I had originally intended to run the game riffing on the Timemaster adventure Sea Dogs of England, but it really didn’t matter. Aside from the non-player characters John Harrington and Heinrich, and a plot to kill the Queen, nothing that happened in my adventure featured in the Sea Dogs. Indeed, having read the adventure and prepared a page of notes, I used virtually none of it and, instead, improvised the whole 3.5 hour adventure. In the end, even the session name, Drakes and Dragons, had nothing to do with the game we played – having had everything to do with the unused plot of the Timemaster adventure. For reference, while Gumshoe driven, TimeWatch emphasizes investigative skills not only as a means to find clues, but a mechanism to be involved in their existence. Rather than use Architecture to know a certain type of building might have a back entrance, a TimeWatch agent could spend a point to actually have been involved in the planning and drafting of the building plans that ensured adequate means of egress for health and safety reasons. Additionally, all characters start with a Stitch – a token they can spend to adjust a General Ability check (or aid a colleague in the same way), limit damage from an attack (or enhance it against an opponent), restore two points to a General Ability pool, or succeed automatically in a trip through time. Whereas other Gumshoe systems have stresses like Stability or Sanity (like in Trail of Cthulhu), TimeWatch has Chronal Stability which represents their solidity within the time stream. As one player commented, Marty McFly at the end of Back to the Future must have had a negative score in Chronal Stability as he played Johnny B Goode – which is a fair analogy. The team kicked off the session crouched behind the grassy knoll. It’s a tough call for any time agent to be involved in the continuation of grim events, but some pose such pivotal shifts you cannot interfere. Having restored the timestream after interference in the recent past to keep Kennedy alive, the team watch as the president slumps back in his car and the crowd around them screams in panic and dismay. Where once a motorcade, now a farmer guides his horse and cart, a stub of grass poking out between tight lips, his face downcast. Wretched wooden stores and tenements surround them, dominated by the light radiating from the only building made of brick and stone – a church. Before the church stand two guards in dark, highly starched uniforms with red cruciform badges on the breast. They carry some kind of automatic weaponry. Surprised by the change, the team determine the need to firstly hide and then find some source of historical information. They made Athletics checks to move cover the distance between the knoll and the nearest building, and Heinz manages to lose his footing. Miles used a point of Outdoor Survival to figure the best way to disturb a horse on the main thoroughfare, distracting the guards attention long enough for Heinz to stumble across the final distance. Behind one of the timber tenements, the team decided to enter the church to seek out historical records and Thelma used Preparedness to have a nearby washing line filled with suitably sized and clean outfits. Once dressed up, Heinz took the lead with his significant expertise in the area of disguise. On approaching the church, the team introduced themselves as visitors from Austin, but a really poor roll made the guard suspicious. However, Heinz piped up with the guards name and enquired about her father’s health – using the familiarity of his Don’t I Know You booster (a benefit of his Disguise being greater than 8). Apologetic for the misunderstanding, the guard allowed them in. Beyond lecterns and desks, and a cluster of monks and clerks, the team found a chained library of reference volumes. They discovered in this world the Holy Roman Empire, and specifically the Catholic Church, had grown exponentially in power following the assassination of Queen Elizabeth in 1587. 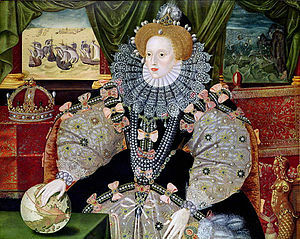 The Spanish Armada attacked and defeated England, occupying it with assistance from the Netherlands and then the Pope himself. Protestantism stumbled and failed, and with the riches of the Americas powering Spain, the Catholic Church flourished. However, while the Church flourished, society and technology slowed to a crawl. The team managed to identify the exact date of Queen Elizabeth’s death – 12 April 1587 – and the individual responsible for the act – Heinrich, an East European ambassador, who would be executed three months later. They jumped back in time to the Tower of London to interview the Ambassador in person, passing the guards with a Bureaucracy spend to have some appropriate paperwork in hand. Heinrich, at first, seemed delirious with his success in killing the Queen in the name of the perfection of the Holy Roman Church. Heinrich mentioned he had hoped to simply divert the Queen from her intent to enter conflict with Spain, but that she had refused and the arrival of Francis Walsingham, the Queen’s spy-master, with a group of lackeys crying of foul deeds and murder plots had forced his hand. He killed the Queen there and then with a weapon of holy light. He refused to give away anything useful, until Heinz worked his Don’t I Know You magic again and passed himself off as a co-conspirator. Heinz flashed his PaciFist weapon – a stun pistol – and queried whether the weapon of holy light looked similar. Heinrich fell for it and confirmed the weapon – though the team worked out the one used by the ambassador might well have been tweaked and overpowered to fire off a single, lethal, battery-draining shot. Heinrich then mentioned John Harrington – and a little History (Contemporary) recognised the name as connected with the influential Levant company of merchants, just gaining power and notoriety in the same period as the Queen’s death. With this information, the team then jumped back in time to 5 April 1587, to offer them time to reconnoitre and form a plan. Jenny messed up her roll and (a) landed up in the Thames and (b) created a ripple that meant the arrival of the team did not go unnoticed, in that a co-conspirator of Harrington became aware of something amiss down near the docks. A suggestion of counter agents, perhaps working for Lord Walsingham, came to the attention of the conspirators. They spend a short time getting to know the area, roaming the streets, finding the location of Harrington, and getting into character. The team visited the Levant company trading house a few days later. The office was not far from their warehouse hideout. Heinz passed himself as an interested investor and with a bit of money and Unobtrusiveness got himself involved with an upcoming enterprise. Harrington took Heinz into his confidence, showing him some stolen Spanish treasure in the store behind his offices, and promised many treasures in return for a modest investment. Harrington asked Heinz if he could be so good as to deliver this letter and a gift to a specific embassy and the ambassador, identified as Heinrich. The team returned to the warehouse make plans. Miles made a few circuits of the area concerned about how easily Harrington had taken Heinz into his confidence, and chanced on a swarthy Eastern European hanging around the docks all too intent on keeping watch on passing events. Mile bribed some local urchins to keep an eye on anyone matching the description of this ne’er-do-well. Miles and Jenny headed off back to the Levant company trading house to see if anything amiss might reveal itself, settling down at the Horse and Candle tavern across the road. Heinz and Thelma visited the embassy. At the embassy, the meeting with Heinrich went well. The team had opened both the letter and the box before hand. The box contained a modified PaciFist, set to overload, which they Tinkered with and rendered harmless. The letter communicated concern from Harrington about increased activity from enemy agents, the need to press on with the plan, and the good progress at Cadiz of King Philip, the preparation of Spanish forces, and the Spanish king’s enterprise. Outside Thelma spied a passing individual hounded by urchins and suspected this might be the very same fellow Miles spotted earlier. When Heinz emerged, they took their rented horse and cart, setting off at pace. The suspicious gent emerged from a side street on horseback, seeking to follow them. Thelma made for Aldgate, trying to both keep ahead, as if hurried, but not lose the tail – and with her in-excess of 8 score in Vehicles, this wouldn’t be a problem. At the same time, Miles and Jenny saw a suspicious cartload of crates and sacks, some similar to those Heinz had seen earlier. The cart carried the heraldry of the Crown, and was headed west across London toward the current Palace residence of Queen Elizabeth. The pair followed at a distance, benefiting from the poor roads of London to keep pace. On the outskirts of London, near Aldgate, the horseman following Heinz and Thelma needed to be delayed, so Thelma’s player made a Preparedness roll to have an order for some crated goods pass across the main thoroughfare through the Aldgate market appear just after their cart, but before the horseman. They passed through Aldgate, listening to cries and curses in their wake. Half a mile out of the city, the horseman finally caught up again, but by this time the agents prepared a welcome. Heinz in the back of the cart aimed a steady shot – with substantial Shooting ability gained from dawn duelling – and stunned the pursuer with a perfect roll of 6 plus 2 points from his pool. Having followed the crates across London, the goods from the Levant company trading house disappeared through the gates into the Palace grounds, beyond the reach of Miles and Jenny. Momentarily frustrated, Miles and Jenny agreed that he would skip back to 4am that morning to check the crates out while they still lay in the store house and Jenny would head back to the Horse and Candle to see if the urchins had discovered anything. Miles skips back in time successfully (with a Stitch to guarantee) and rummages through the crates and sacks. In the largest he finds a fine suit of Spanish armour in straw packing – which he soon after realizes has been internally modified to double as a radiation-proof suit. In the next largest he finds a barrel with a readout attached via wires in a pile of Styrofoam pellets. His military knowledge identifies this as some sort of micro nuclear device. Deeply concerned, his attention isn’t up to the task of spotting he’s being watched until a brilliant beam of light cuts through the darkness and misses. Miles attempts to find the attacker and spots a dull glow from the recharging beam weapon. Alas, the glow disappears and in the mix of Unobtrusiveness rolls, Miles fails. Another beams cuts through the darkness and smacks him in the chest (with enough damage to drop him to only a couple of Health). He recovers, a smouldering spot on his doublet, and charges towards the dull glow at the back of the store, barrelling the attacker to the ground and firing a point blank PaciFist shot into the torso. The attacker fails to resist the effect and Mile heaves the body through the back door and dumps it in the Thames. He then returns to the store and transports the nuclear device a few days into the past, for safety, before returning to the present and the warehouse. At the warehouse, the team swap stories and Miles recognizes the unconscious man, who tailed Heinz and Thelma, as the guy from the 4am fight. Fearing a paradox if they see each other or that word might have already got out that the conspiracy has been uncovered, Heinz hatches a plan. He disguises himself to resemble the unconscious man, takes his weapon (which Miles had retained) and jumps back in time, while Jenny also heads back in time. Jenny goes to the previous day, hangs around the Horse and Candle until she spots the man, then launches into full flirtation and carousing mode to get him drunk as a skunk. Heinz goes to the storehouse behind the Levant company office at a time just before Mile’s arrival at 4am in the morning. When Miles finishes opening the crates, Heinz takes a shot to miss, then a shot to wound – rolling particularly well by spending 3 points from his Shooting pool – before Miles barrels into him, stuns him and dumps him in the Thames. A short while later, Heinz comes round, washes up and heads back to the future, as does Jenny after she leaves the drunken lackey in a stupor, certain his guilt about the night will likely fuel his vigilance the following day to track down Heinz and Thelma at the embassy. Once the delivery to the Palace takes place, they bide their time and make enquiries on how best to reach Walsingham. Realising they had handed the letter from Harrington over to Heinrich – which would be vital in convincing Walsingham, one of the team spends Forgery and makes a Preparedness check to have had the foresight to make a copy (actually Jenny had the Preparedness booster ability Flashback that would have allowed her to narrate such a preparation, if she’d so wished). Heinz uses his disguise and influence to get a meeting with the spy-master, hand him the evidence, and accompany him as he storms into the audience chamber where the Queen has met Heinrich. Panicked, the Ambassador pulls his weapon, but on pressing the buttons nothing happens and he’s overpowered. A Chronal Stability roll avoids any negative effect of Heinrich recognizing the team in the future when they meet him in the cell – and the conspiracy ends there… with no bomb in place as a backup plan. Walsingham arrests Harrington, who the team reveal to be a disguised ‘agent of the enemy’ and rescue the real Harrington, who the conspirators kidnapped and dumped in Glasgow, without money and clothes. Despite the loose end that some evil mastermind seems to have been behind this, but remained illusive in all but name – The Cardinal – the team return to the restored future having won through for another day. I enjoyed it. Comments from the players seemed to suggest the same. Key constructive comment from the fellow who played Thelma was the need for TimeWatch to explain the business of time travel and Abilities very clearly indeed. It seems a bit of a Unique Selling Point that the game takes the Gumshoe systems own Unique Selling Point of must-have clue management and spins it out into something strange and wonderful. You don’t just find the core clue, you can engineer its very presence or existence in a situation. The final situation with the team resolving the possible paradox led to much energetic discussion and a few puzzled looks. I must admit I needed to have someone explain the complications to me a second time – and I may still have missed something in putting this account together. The game appears to handle paradox and the threat of it quite well – and we didn’t experience any problems. Indeed, the whole team had a real heads down moment when Chronal Stability scores started tumbling and they’d already burned through the Stitches that would ensure certain success on future time jumps.